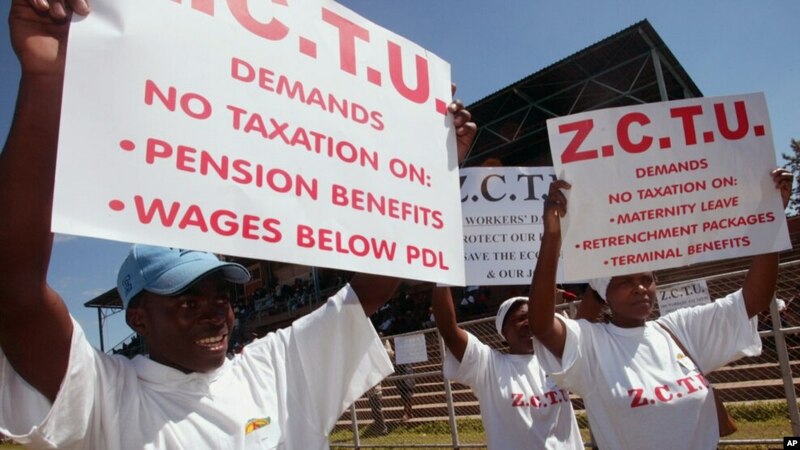 January 28, 2017 — Links International Journal of Socialist Renewal reposted from Pambazuka News — The relatively recent history of Zimbabwe’s working class and its supporters is very rich and provides answers to the challenges for the future. The working class as a whole provided inspiration to the fights against unemployment and oppression. It is worth re-looking that history to provide some answers. August 6, 2013 -- For a good part of his 33 years in power, Robert Mugabe has presided over a ruthless dictatorship. From the thousands killed in the 1980s Gukurahundi massacres and misery for millions under ESAP [structural adjustment plan], Operation Murambatsvina and hyper-inflation of 2008. Yet in the July 31 general election, endorsed by Southern African Development Community and African Union, the 89-year -old ruler annihilated the hitherto iconic working-class leader Morgan Tsvangirai and his Movement for Democratic Change (MDC-T), who beat him in March 2008. Mugabe got 61% to Tsvangirai’s 34%. The Zimbabwe African National Union-Patriotic Front (ZANU-PF) won a 76% parliamentary majority, enough to re-write the new constitution and doing better than it did in 1980. Zimbabwe President Robert Mugabe votes yes to the new constitution. 1. Despite the boasting of the “Yes” group that at 93% or 3,079,966 votes they scored a landslide victory [in the March 16-17, 2013, constitution referendum], the 5.4% or 179,489 scored by “No” is a very significant minority. In most urban areas the no vote was over 7% of the vote, scoring more than 1000 votes in constituencies. The voter turn-out, at 3.3 million or 55% of registered voters or slightly less than 50% if one considers all eligible voters, was not overwhelming. For more on Zimbabwe, click HERE. For more on the ISOZ, click HERE. 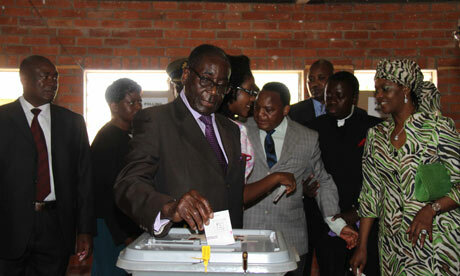 March 2013 -- The people of Zimbabwe go to the polls on March 16, 2013, to endorse or reject a draft constitution. The latest edition of the International Socialist Organisation Zimbabwe's (ISOZ) newspaper, Socialist Worker, is almost entirely devoted to arguments against adoption of what it describes as a deeply flawed "elitist peace pact by the three parliamentary political parties (ZANU-PF, MDC-T, MDC) and their Western backers”. The COPAC constitution is a negotiated and elitist peace charter by the three parliamentary political parties and their Western backers. Above the MDC's Morgan Tsvangirai and ZANU-PF's Robert Mugabe at a meeting to discuss the draft constitution. Johannesburg protest in support of the "Zimbabwe 6", March 20, 2012. March 22, 2012 – Links International Journal of Socialist Renewal/Green Left Weekly -- Six Zimbabwean activists who were convicted for watching a video of the Arab Spring in February 2011 won a partial victory on March 21 when they were given suspended jail sentences of two years, ordered to each do 420 hours of community service and pay a fine of US$500 each. The six activists were convicted in the Harare Magistrates Court on March 19 of trumped-up charges of “conspiracy to commit public violence”. They had faced up to 10 years’ imprisonment, a sentence demanded by the state prosecutor, Edmore Nyazamba. Zimbabwe: Activists found 'guilty' on trumped-up charges -- protests keep them out of jail! 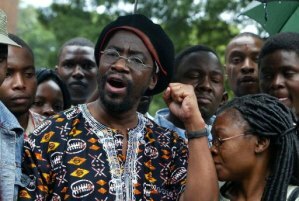 Munyaradzi Gwisai, a political activist and former member of parliament, left court in Harare on March 19 after being convicted of plotting to overthrow the government. Photo by Tsvangirayi Mukwazhi/Associated Press. STOP PRESS: March 21, 2012 -- The final verdict is two years' jail, suspended for five years (on condition that no similar "offence" is committed), 420 hours of community service (about six weeks Mon.-Fri.) and an US$500 fine each. The sentence is designed to be a chain on their ankles, but clearly the state does not feel confident to smash them. That is certainly a victory for the mass showings at the courts in Harare, and the international solidarity campaign that included the sending of protests messages from around the world and the holding of pickets and demonstrations. Viva, viva comrades there for resisting the intimidation, and also for the many forms of international solidarity. Links International Journal of Socialist Renewal would like to thank its many readers for their participation in the campaign. Zimbabwe activists in danger of unlawful prison sentences – Solidarity needed! Supporters of the activists facing unlawful imprisonment. The following statement was issued by the South African Municipal Workers Union (SAMWU). Readers of Links International Journal of Socialist Renewal are urged to phone, email or send protest messages demanding the release of the six Zimbabwe activists to the Zimbabwe embassy or consulate in their countries. Solidarity actions are being organised in South Africa. Please send copies of protest messages sent to socialismfrombelow@gmail.com (copy to ashley_fataar@yahoo.co.uk and shanthabloemen@gmail.com). 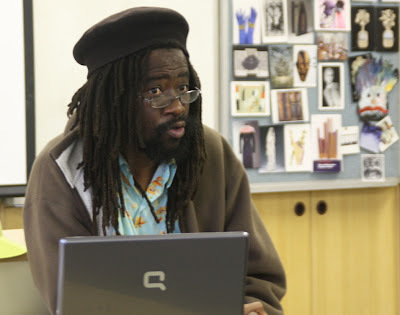 Action is support of the charged Zimbabwean activists, Fremantle, Western Australia. Six Zimbabwean socialists are charged with “inciting public violence” (which carries a maximum penalty of 10 years’ imprisonment). Munyaradzi Gwisai, director of the Labor Law Centre, Tafadzwa Choto and Tatenda Mombeyarara, trade unionist Edison Chakuma, debt rights activist Hopewell Gumbo and student leader Welcome Zimuto were arrested on February 19 while meeting to watch video footage of democracy protests in Egypt and Tunisia (David Mpatsi, one of the 45 activists originally charged with treason for attending the film screening, died following a rapid deterioration in his health while he was imprisoned and denied medical treatment). The following letter explains the latest developments. For more background to the case, click HERE. February 16, 2012 -- Yesterday Magistrate Kudakwashe Jarabini dismissed the defendants' application for the discharge of charges of conspiring to commit public violence. Their lawyer, Alex Muchadehama had applied for discharge at the close of the state's case on the basis that the state had failed to produce sufficient evidence to require the defendants to put up a defence. August 14, 2011 -- Links International Journal of Socialist Renewal -- The following petition is being circulated in Australia. Please feel free to adapt the text for use in your country (e.g. insert details of your local Zimbabwe embassy and your own government's foreign ministry. For more detail on the case, see http://links.org.au/taxonomy/term/171. You can download a postcard version to send direct to Zimbabwe HERE. International solidarity activities in February and March condemning the arrests were an important contribution to having the original charges of "treason" dropped and the comrades released on bail. But the campaign isn't over and the comrades are asking for any solidarity that can be extended to them on or before August 22. Action in solidarity with the Zimbabwe socialists, July 18, 2011. June 7, 2011 -- The Zimbabwean state has dropped the most serious charges against six activists who faced the death penalty for treason. (Click here for background articles.) They now face the lesser charge of “subverting a constitutional government”—but this still carries a maximum sentence of 20 years. Their trial begins on 18 July. Their bail conditions have also been relaxed—they have to report to the police once a month instead of three times a week. The six, including former MP Munyaradzi Gwisai, were among more than 40 people arrested on February 19 for watching a video about the revolutions in Egypt and Tunisia. Keep up the international pressure and solidarity to get all of the charges dropped. Account Name: CDL–MINE–LINE Worker Solidarity Fund. Deposit reference: Zimbabwe Treason Trialists Solidarity Fund. Current account number: 100 185 3784. SWIFT code: NEDSZAJJ. March 18, 2011 -- Solidarity with Zimbabwean Political prisoners -- Thanks in part to donations from supporters abroad, friends and family raised the $12,000 US needed to get the six prisoners released on bail on March 17. They are now back with their loved ones -- but will be in court on March 21, standing trial for treason. The international day of action in solidarity with the Zimbabwean activists remains as urgent as ever. Now the demand is even simpler: Drop all charges now! STOP PRESS March 11, 2011: Munyaradzi Gwisai, Tafadzwa Antonater Choto, Hopewell Gumbo, Tatenda Mombeyarara, Edson Chakuma and Welcome Zimuto had their application for refusal of remand thrown out and remanded to March 21 to face trial for treason which carries a death sentence in Zimbabwe. For the latest news, visit the new solidarity web site at http://www.freethemnow.com/. (Updated March 4) Zimbabwe: Socialists and Egypt solidarity activists charged with treason! Protest urgently needed! 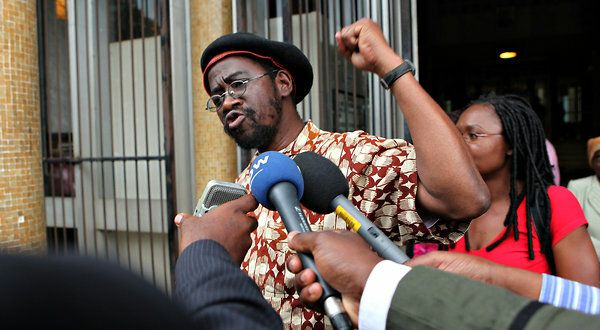 February 25, 2011 -- It has now been confirmed that detained labour movement activist and leading member of the International Socialist Organization Zimbabwe Munyaradzi Gwisai (pictured) and 45 other activists detained by the Zimbabwe state on February 19 have been charged with treason. If found guilty of treason, the activists risk a sentence of death or life imprisonment. They are being tortured to extract bogus confessions. The arrests followed a raid on a closed meeting that was discussing the implications of the revolutions in the Arab world. Gwisai is director of the Labor Law Centre and former Movement for Democratic Change (MDC) MP. Robert Mugabe (centre) and GNU partners Morgan Tsvangirai (left) and Arthur Mutambara. November 30, 2010 -- Socialist Worker (Zimbabwe) -- Several significant events in the political and constitutional framework of Zimbabwe have occurred in recent months. First, are the controversies surrounding the Constitutional Parliamentary Committee (COPAC) outreach exercise carried out from June 2010 to date. Second is the crisis in the Government of National Unity (GNU) following various unilateral state executive appointments by President Robert Gabriel Mugabe. "The MDC roots were in the popular challenge to ZANU-PF in the late 1990s and the social movements on which it rested." June 28, 2010 – Zimbabwe’s economy has been in free fall. Between 2000 and 2005, the economy contracted by more than 40 per cent. Today GDP per capita is estimated to be the same as it was in 1953. Before the replacement of the Zimbabwe dollar with the US dollar and the South African rand in 2009, the country had the highest inflation rate in the world, soaring to 165,000 per cent in February 2008. Robert Mugabe and Morgan Tsvangirai hoped to steer through an elite-driven constitution. Photo from http://kickmugabeout.blogspot.com/. July 25, 2009 -- The first All-Stakeholders' Conference aimed at drafting a new constitution in Zimbabwe was held in Harare on July 13-14. The constitutional reform process is the result of the agreement reached between President Robert Mugabe's Zimbabwe African National Union-Patriotic Front (ZANU-PF) and the Movement for Democratic Change (MDC), when they formed a power-sharing government in February 2009. The agreement between ZANU-PF and the MDC sets an 18-month timeline for drafting the constitution. It mandates two so-called all-stakeholders’ conferences and national consultation, but the process is controlled by a parliamentary committee. The final draft is to be determined by parliament before going to a referendum. Many in the pro-democracy movement believe the constitutional reform process is dominated by politicians and will fail to incorporate the demands of ordinary Zimbabweans suffering worst from the country’s social and economic crisis. Munyaradzi Gwisai of the ISOZ at the World at a Crossroads conference. Photo by Alex Bainbridge. May 6, 2009 -- The formation of the government of national unity (GNU) in Zimbabwe between the opposition Movement for Democratic Change (MDC) and Robert Mugabe's Zimbabwe African National Union-Patriotic Front (ZANU-PF) in February 2009 was the logical outcome of the agreement made between them in the middle of last year. The final negotiations had stalled as Mugabe tried to manipulate the details to exact maximum concessions from the MDC. Photos by Alex Bainbridge. Individual pictures can be viewed here. Sydney -- April 18, 2009 -- Green Left Weekly -- Several participants at the World at a Crossroads conference, held in Sydney on April 10-12, remarked that the conference could not have been better named. As the world economy lurches into a deep recession, and the looming climate emergency reaches a crisis point, the world truly is at a crossroads. The future will be decided in the conflict between the greedy capitalist elites and those around the world fighting for a far better world — a world free of racism, war and environmental plunder.